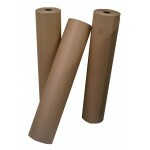 Great prices and great quality Brown Imitation Kraft Paper - 88gsm in various lengths. This superb quality strong brown wrapping paper is perfect for adding a little extra protection to the packages and parcels you are sending out by courier or Royal Mail. They are available in different widths 1200mm, 900mm or 600mm to suit your particular parcels. We carry stock of the two main types of brown kraft wrapping papers, imitation kraft rolls and pure kraft rolls. The main differences between the two products are that the pure kraft paper is as its name implies, manufactured from pure wood pulp, whereas imitation kraft paper is manufactured from recycled paper fibres. This endows the pure kraft roll with higher strength and it is a more durable paper. The imitation kraft has a lower burst strength but is more than adequate for the majority of wrapping applications. It is also less expensive.